"Crockery" redirects here. For the township, see Crockery Township, Michigan. "Dinner service" redirects here. For the meal, see Dinner. "Dinnerware" is another term used to refer to tableware and "crockery" refers to porcelain and bone china produced by makers such as Sèvres in France, Meissen in Germany, Royal Copenhagen in Denmark, Royal Doulton in England, or Belleek Pottery in Northern Ireland. Sets of dishes are referred to as a table service, dinner service or service set. Table settings or place settings are the dishes, cutlery and glassware used for formal and informal dining. In Ireland such items are normally referred to as delph, the word being an English language phonetic spelling of the word Delft, the town from which so much delftware came. Silver service or butler service are methods for a butler or waiter to serve a meal. Setting the table refers to arranging the tableware, including individual place settings for each diner at the table as well as decorating the table itself in a manner suitable for the occasion. Tableware and table decoration is typically more elaborate for special occasions. Unusual dining locations demand tableware be adapted. Dishes are usually made of ceramic materials such as earthenware, stoneware, faience, bone china or porcelain. However, they can be made of other materials such as wood, pewter, silver, gold, glass, acrylic and plastic. Before it was possible to purchase mass-produced tableware, it was fashioned from available materials, such as wood. Industrialisation and developments in ceramic manufacture made inexpensive washable tableware available. It is sold either by the piece or as a matched set for a number of diners, normally four, six, eight, or twelve place settings. Large quantities are purchased for use in restaurants. Individual pieces, such as those needed as replacement pieces for broken dishes, can be procured from "open stock" inventory at shops, or from antique dealers if the pattern is no longer in production. Possession of tableware has to a large extent been determined by individual wealth; the greater the means, the higher was the quality of tableware that was owned and the more numerous its pieces. In the London of the 13th century, the more affluent citizens owned fine furniture and silver, "while those of straiter means possessed only the simplest pottery and kitchen utensils." By the later 16th century, "even the poorer citizens dined off pewter rather than wood" and had plate, jars and pots made from "green glazed earthenware". The nobility often used their arms on heraldic china. 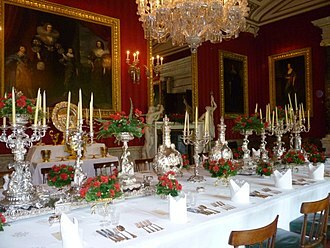 Tableware is generally the functional part of the settings on dining tables but great attention has been paid to the purely decorative aspects, especially when dining is regarded as part of entertainment such as in banquets given by important people or special events, such as State occasions. Table decoration may be ephemeral and consist of items made from confectionery or wax - substances commonly employed in Roman banqueting tables of the 17th century. During the reign of George III of the United Kingdom, ephemeral table decoration was done by men known as "table-deckers" who used sand and similar substances to create marmotinto works (sand painting) for single-use decoration. In modern times, ephemeral table decorations continue to be made from sugar or carved from ice. In wealthy countries such as 17th century France, table decorations for the aristocracy were sometimes made of silver. One of the most famous table decorations is the Cellini Salt Cellar. Ephemeral and silver table decorations were replaced with porcelain items after its reinvention in Europe in the 16th century. A table setting in Western countries is mainly in one of two styles: service à la russe (French for "in the Russian style"), where each course of the meal is brought out in specific order; and service à la française (French for "in the French style"), where all the courses for the meal are arranged on the table and presented at the same time that guests are seated. Service à la russe has become the custom in most restaurants, whereas service à la française is the norm in family settings. Place settings for service à la russe dining are arranged according to the number of courses in the meal. The tableware is arranged in a particular order. With the first course, each guest at the table begins by using the tableware placed on the outside of place setting. As each course is finished the guest leaves the used cutlery on the used plate or bowl, which are removed from the table by the server. In some case, the original set is kept for the next course. To begin the next course, the diner uses the next item on the outside of the place setting, and so on. Forks are placed on the left of a dinner plate, knives to the right of the plate, and spoons to the outer right side of the place setting. Plates Dinner plate with rolled table napkin; small bread plate above forks. Glasses Small glass for water, larger one behind for red wine, and smaller wine glass for white wine. Cutlery (from the outside toward the plate) Fish cutlery (knife and fork, as fish will be served without any sauce, otherwise it would be a fish spoon (cuillère à gourmet)); meat cutlery and cheese or fruit cutlery, the end of the knife rests on a knife rest. Above the plate, dessert cutlery (spoon and fork). Items of tableware include a variety of plates, bowls; or cups for individual diners and a range of serving dishes to transport the food from the kitchen or to separate smaller dishes. Plates include charger plates as well as specific dinner plates, lunch plates, dessert plates, salad plates or side plates. Bowls include those used for soup, cereal, pasta, fruit or dessert. A range of saucers accompany plates and bowls, those designed to go with teacups, coffee cups, demitasses and cream soup bowls. There are also individual covered casserole dishes. Dishes come in standard sizes, which are set according to the manufacturer. They are similar throughout the industry. Plates are standardised in descending order of diameter size according to function. One standard series is charger (12 inches); dinner plate (10.5 inches); dessert plate (8.5 inches) salad plate (7.5 inches); side plate, tea plate (6.75 inches). Glasses and mugs of various types are an important part of tableware, as beverages are important parts of a meal. Vessels to hold alcoholic beverages such as wine, whether red, white, sparkling tend to be quite specialised in form, with for example Port wine glasses, beer glasses, brandy balloons, aperitif and liqueur glasses all having different shapes. Water glasses, juice glasses and hot chocolate mugs are also differentiated. Their appearance as part of the tableware depends on the meal and the style of table arrangement. Tea and coffee tend to involve strong social rituals and so teacups and, coffee cups (including demitasse cups) have a shape that depends on the culture and the social situation in which the drink is taken. See also: Category:Silversmiths by nationality. Cutlery is an important part of tableware. A basic formal place setting will usually have a dinner plate at the centre, resting on a charger. The rest of the place setting depends upon the first course, which may be soup, salad or fish. If soup is the first course, to the left of the dinner plate, moving clockwise, are placed a small salad fork to the left of the dinner plate; a large dinner fork to the left of the salad fork; a side plate above the forks; a wine or water glass above and to the right of the dinner plate; a large dinner knife to the right of the dinner plate; a smaller butter knife to the right of the dinner knife; a dinner spoon to the right of the knives; a soup spoon to the right of the dinner spoon. If salad is the first course, the soup spoon is skipped. The dinner fork is placed immediately left of the dinner plate; the salad fork is placed on the outer left side of the place setting. In either arrangement, the napkin may either rest folded underneath the forks, or it may be folded and placed on the dinner plate. When more courses are being served, place settings may become more elaborate and cutlery more specialised. Examples include fruit spoon or fruit knife, cheese knife, and pastry fork. Other types of cutlery, such as boning forks, were used when formal meals included dishes that have since become less common. Carving knives and forks are used to carve roasts at the table. A wide range of serving dishes are used to transport food from kitchen to table or to serve it at table, in order to make food service easier and cleaner or more efficient and pleasant. Serving dishes include: butter dishes; casseroles; fruit bowls; ramekins or lidded serving bowls; compotes; pitchers or jugs; platters, salvers, and trays; salt and pepper shakers or salt cellars; sauce or gravy boats; tureens and tajines; vegetable or salad bowls. A range of items specific to the serving of tea or coffee also have long cultural traditions. They include teapots and coffee pots as well as samovars, sugar bowls; milk or cream jugs. Chinese table settings are traditional in style. Table setting practices in Japan and other parts of East Asia have been influenced by Chinese table setting customs. The emphasis in Chinese table settings is on displaying each individual food in a pleasing way, usually in separate bowls or dishes. Formal table settings are based upon the arrangements used in a family setting, although they can become extremely elaborate with many dishes. Serving bowls and dishes are brought to the table, where guests can choose their own portions. Formal Chinese restaurants often use a large turning wheel in the centre of the table to rotate food for easier service. In a family setting, a meal typically includes a fan dish, which constitutes the meal's base (much like bread forms the base of various sandwiches), and several accompanying mains, called cai dish (choi or seoung in Cantonese). More specifically, fan usually refers to cooked rice, but can also be other staple grain-based foods. If the meal is a light meal, it will typically include the base and one main dish. The base is often served directly to the guest in a bowl, whereas main dishes are chosen by the guest from shared serving dishes on the table. Japanese ceramic tableware is an industry that is many centuries old. Unlike in Western cultures, where tableware is often produced and bought in matching sets, Japanese tableware is set on the table so that each dish complements the type of food served in it. Since Japanese meals normally include several small amounts of each food per person, this means that each person has a place setting with several different small dishes and bowls for holding individual food and condiments. The emphasis in a Japanese table setting is on enhancing the appearance of the food, which is partially achieved by showing contrasts between the items. Each bowl and dish may have a different shape, colour or pattern. Not all of these plates and bowls would be necessary for one meal. A rice bowl, a soup bowl, two or three small dishes with accompanying foods, and two or three condiment dishes for person would be typical. Various serving bowls and platters would also be set on a table for a typical meal, along with a soy sauce cruet, a small pitcher for tempura or other sauce, and a tea setting of tea pot, tea cups and tea cup saucers. Business-class airline meal with tightly arranged plates, single-service condiments and serving tray. Tableware for special circumstances has to be adapted. Dining in the outdoors, for example, whether for recreational purposes, as on a picnic or as part of a journey, project or mission requires specialised tableware. It must be portable, more robust and if possible, lighter in weight than tableware used indoors. It is usually carefully packed for transportation to the place where it will be used. ^ Bloomfield, Linda (2013). Contemporary tableware. London: A. & C. Black. ISBN 9781408153956. ^ Venable, Charles L.; et al. (2000). China and Glass in America, 1880-1980: From Table Top to TV Tray. New York: Harry N. Abrams. ISBN 0-8109-6692-1. ^ a b Savage, George (1970). Dictionary of Antiques ([2nd rep.] ed.). London: Barrie & Jenkins. pp. 419–420. ISBN 0214652459. ^ Cunningham, Marion (1996). The Fannie Farmer Cookbook. Alfred A. Knopf, Inc. p. 817. ISBN 0679450815. ^ "Place marker". Horniman Museum and Gardens. ^ a b Kotschevar, Lendal H. & Valentino Luciani (2006). Presenting Service: The Ultimate Guide for the Foodservice Professional. John Wiley & Sons. p. 119. ISBN 9780471475781. ^ Newman, Jacqueline M. (2004). Food Culture in China. Greenwood Publishing Group. p. 105. ISBN 9780313325816. ^ Lowry, Dave (2010). The Connoisseur's Guide to Sushi: Everything You Need to Know about Sushi Varieties and Accompaniments, Etiquette and Dining Tips, and More. ReadHowYouWant.com. pp. 313–4. ISBN 9781458764140. ^ Moriyama, Naomi (2006). Japanese Women Don't Get Old or Fat: Secrets of My Mother's Tokyo Kitchen. Random House Digital. pp. 74–5. ISBN 9780385339988. 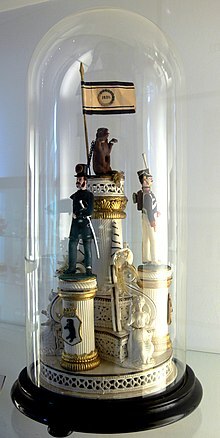 Von Drachenfels, Suzanne (2000). The Art of the Table: A Complete Guide to Table Setting, Table Manners, and Tableware. Simon & Schuster. ISBN 0-684-84732-9. Jones, Edward Alfred (1911). "Plate" . Encyclopædia Britannica. 21 (11th ed.). pp. 789–804.